LUFKIN, TEXAS – Texas Forestry Association (TFA) presented Rep. Trent Ashby with the Outstanding State Legislator of The Year award during the Association’s annual convent held Oct. 25-27, 2017, at The Fredonia Hotel in Nacogdoches, Texas. 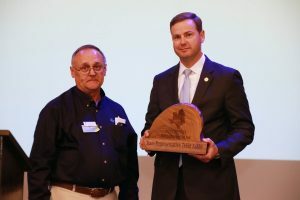 The award was given to honor Rep. Ashby’s efforts in helping TFA secure a rule change in the Texas Commission on Environmental Quality’s air quality rules for prescribed burning. He listened to the concerns of Certified Prescribed Burn Managers and with his leadership, and the support of his staff, we were successful in getting a rule change to support the future use of prescribed burning conducted by Certified and insured Prescribed Burn Managers. State Representative Trent Ashby receives the Outstanding Legislator Of The Year Award from TFA Executive Director Ron Hufford during the association’s annual convention held at The Fredonia Hotel Oct 25-27, 2017.